A pocket knife that contains multiple functions including a corkscrew and scissors, the Swiss Army Knife is today the world’s most recognizable “multi-tool.” The varied attachments are housed inside the knife’s handle, which is usually a distinctive red in color – although some military versions of the knives are colored Army green. The multi-tool that is now known as the Swiss Army Knife was first issued in 1897 in Ibach Schwyz, a community in the Swiss Alps near Lake Lucerne. The Knife was designed by Karl Elsener, who owned a company that primarily developed surgical instruments for doctors. The very first model of the knife contained two blades – a large and small one – and a corkscrew. Early versions of the knife were used by Swiss soldiers to open canned food and wine, and strip their service rifles. Today, the company that develops the Swiss Army Knife is still run by the Elsener family. Current models of the knives range from a single blade to more than 50 attachments that include everything from tweezers to a laser pointer and digital clock. In 2006, to mark the 100th Anniversary of Wenger SA’s manufacturing of Swiss Army Knives, the company issued a version of the device that contained 85 instruments and sold for $1,400.00. The Swiss Army Knife remains a tool that is widely used by soldiers and civilians around the world. While the U.S. military does not issue the devices to its personnel, the knives are frequently purchased by American soldiers in military PX stores around the world. 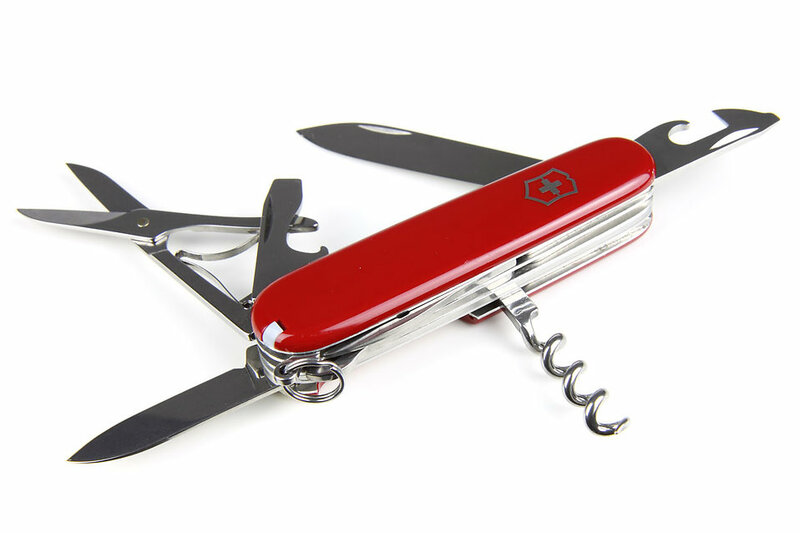 The Swiss Army Knife has also become a recognizable piece of popular culture. The Guinness Book of World Records lists a Swiss Army Knife that has 314 blades as having the most knife blades in one instrument. And, the multi-tool has been displayed by the New York Museum of Modern Art and the State Museum of Applied Art in Munich, Germany.